The FSMA regulations have made food safety a high priority. Processing equipment, wash downs, and sanitation are obvious areas that need your attention. However, unprotected concrete floors harbor microbes as well as protected floors that have cracks, chips, dust, or flakes in the concrete. Ensure your floor's protection. Concare’s key employees are HACCP and HARPC trained, delivering concrete protection flooring solutions that are both USDA and FDA compliant. Concare takes into account the necessary precautions when preparing and installing a new floor or floor repairs. Why? Most flooring contractors use a preparation method called shotblasting. It’s a fast way to get the job done, however for food companies it’s one of the worst preparation methods as metal and particles can easily make its way onto the equipment even if it’s covered! Don’t take the chance of getting the metal and other small particles into the product only to get consumed. Because of your interest in achieving HACCP or HARPC compliance, Concare will conduct a complimentary evaluation of your floors & walls. 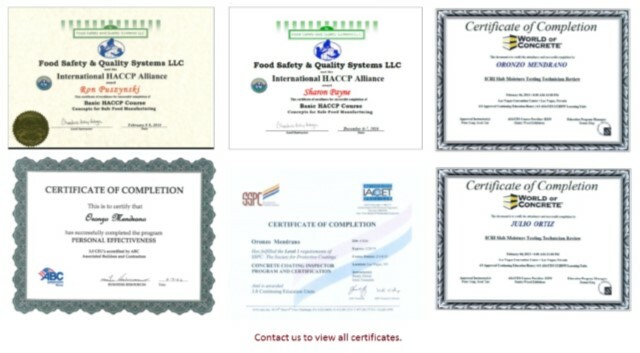 Remember, we’re HACCP and HARPC trained. Get more information on our food, beverage, wine & spirits concrete floor coatings solution. Contact us today at fsma@concare.com to get started. Don’t put your facility at risk of being shut down.